Do You Want More?!!!??! 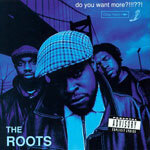 was the Roots major label-debut, coming two years after their independent debut album, Organix (1993). Out of print for years, now back on blue vinyl for its 20th Anniversary. 9. Do You Want More?!!!?? !